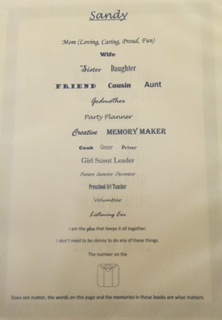 Seeking Sandy: Who are you? I wrote this post a few months back, but did not post it. Now I feel that it needs to be seen. I did not go back and change all the wording to say it was a few months ago that I was in a women's group, but know that this all took place months ago! I had a groundbreaking moment that I need to share with everyone! I feel like not only was this a major breakthrough for me, but I believe this post can help a lot of people put their life into perspective. I have been working with a women's group based upon the research and teachings of Brene Brown. If you haven't heard of her, you should, go out and buy her book, The Gifts of Imperfection. It was the first "self help" book I bought when I started to work on myself this fall and it has stuck with me. I have recommended it to multiple people and I am now working on her book, Daring Greatly. The topics we are working on in women's group are based upon the information in Daring Greatly. We talked a lot about your authentic self, shame, empathy and vulnerability. The group was amazing because although everyone has a different story and are at different times in life, we all share a ton of the same feelings. It is such an amazing group of women who came together not knowing each other and almost instantly became connected in such a vulnerable way. They know more about my feelings on certain things than some of my very best friends. Last week, we had to share a creative project. It had no instruction other than you should be presenting something about you in regards to the information we had learned. This is where my groundbreaking moment happened. I talked about how my biggest shame is about body image. This has been huge for me for the past 10 years, but I am beginning to realize that I am so much more than how I look. I am all of the things on the sheet and more! Not one of these things require me to have a skinny perfect body. I can do all of these things and do them well, just as I am. 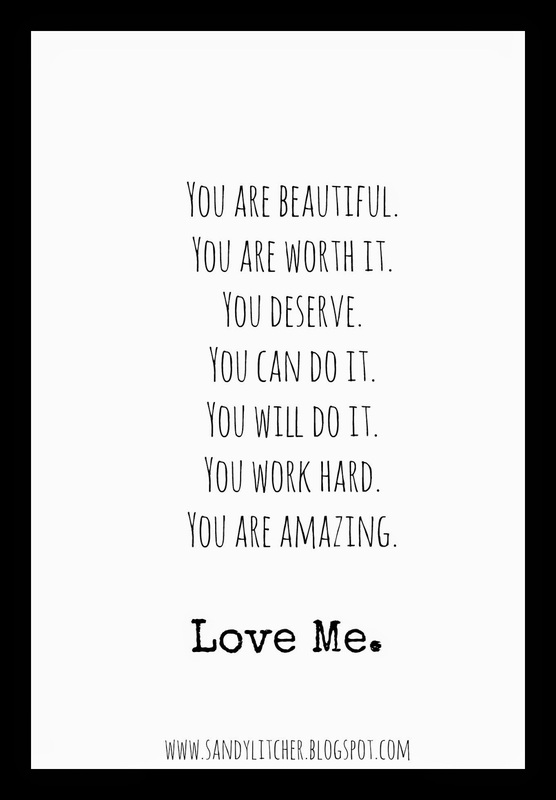 I made this picture when I started talking about being worth it and being kind to myself. 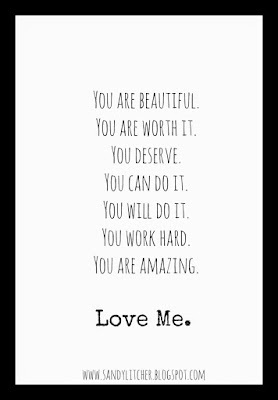 I shared it with the women in my group and handed out a small pocket copy for each of them because let's be honest, who doesn't need to be reminded how beautiful and amazing they are every once in a while??!! I have thought for such a long time that I wasn't happy because I was overweight, but truly I had a lot of other junk that was making me unhappy. The more I work on the big picture the nicer I get to myself. My groundbreaking moment really was when I started to realize that my authentic self has nothing to do with my appearance. Being skinny isn't going to make me happy. It is going to make it so I am less self conscious and I will pull at my clothing less, but it isn't going to change me. I am not going to be a better friend because I am skinny, I am a good friend when I put effort into being a good friend. I have learned to be nicer to myself. When I decide to eat a piece of chocolate because I "need" it, I don't call my self a no willpower loser (at least not all the time, I am by no means perfect yet!) I just move on and make better choices the rest of the day. I am being kind to me. Trying to be as kind to me as I would be to a friend. When I take all my negative thoughts and change them to positive thoughts it is amazing the difference my world feels. Does this resonate with anyone? Do you feel that your appearance defines you? 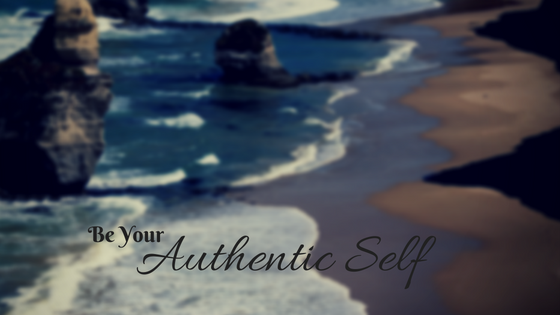 Try making your list about your authentic self. I bet you find that inside you are so much more than what everyone sees! And that is what should be most important to you and everyone around you!